Thought I'd make one of these things! Really liked this car. When I was thinking about buying it, I was tossing up between a 2.5i and a 3.0R (but a pre-facelift). I really like the post facelifted models a fair bit more and was pretty keen to save a bit of fuel. My previous car was a BA Falcon (dual fuel) so it was pretty cheap to run and maintain. I was a little worried about the 6 month servicing costs that a Subaru would have and also that parts would be more expensive, etc. So, I went for the 2.5i. Whilst I didn't mind the power that it produced, ultimately that's the reason why I wanted to change it. The car was in pretty good condition but it needed the timing belt done, so I decided that it was time to change over to something with a bit more power - the 3.0R Spec B.
Whilst I still had my car, I did want to sell it before I got a new one. I did drive a 3.0R Spec B which pretty much fit the bill - in my price range, reasonable km, silver and around the same age. I would have bought it had my car been sold at this point in time, but it wasn't, so I didn't. When I did eventually sell my car, not many that appealed to me were around. 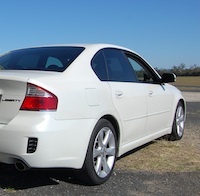 I drove a couple of Spec.B's, and they were nice and I was still pretty well set on getting one. I found a used one at Subaru but the condition wasn't the greatest. I thought if Subaru could fix up a couple of the issues with it, I'd be happy enough. I offered to buy it a couple of times but they were pretty stubborn and just rejected my offer without even negotiating, so I walked away both times. Third time I went there, I was set on buying it. I thought I'd take it for another drive and just make sure. However, I noticed even more issues that third time and took any offer I had off the table. I stopped at another Subaru dealership on the way home, knowing they had a GT. It was blue, but I thought what they heck, I'll give it a drive and see what its like. I'd never taken a turbo car for a drive before besides a Golf Diesel. It probably took around 5 minutes into the test drive to feel that the GT was the car I was now after. Much preferred the power delivery than the 3.0 and felt like the fuel consumption would be better in suburbia than a 3.0. In my opinion, the 3.0 goes like a rocket when you kick down, but lower down you can feel the extra weight a bit. The 2.5 turbo feels a little bit more nimble and suits my driving style a bit more in that I live in the suburbs and start stop from time to time. So, it's got the 2.5 efficiency, to a certain degree, but also the thrill of the 3.0 when need be. Cut a long story short, Subaru got in contact with me the last day of the month saying that I could have it for a certain price. I'd already put a deposit down on a GT Spec B earlier that week (in Diamond Gray), but I decided to go with the GT instead, saving a bit of cash and, to a lesser extent, having softer suspension I felt was a plus. The Bilsteins are nice, but a little bit too harsh and I wasn't sure of what sort of money I'd be throwing around softening it up a bit. The Spec B hadn't been serviced for 13 months too even though it did only 6,000km in that time. But, it was a little off putting anyway. So, I end up with a blue car, which definitely wasn't my first choice. I love driving it though (in the 5 or so days I've owned it) and will probably warm to the colour. I call it The Cookie Monster which adds 5kw ATW. Subaru will do the timing belt service for me, tyres are relatively new and rego is done for the year (which all helps) and I'm happy with the price I got it for. Loving the leather, sunroof, SI-Drive, paddles and McIntosh and of course looking out onto the scoop has a nice feel. The GT and 3.0 (and Spec B varients) feel quite different to the standard 2.5 - especially the Spec B. They feel so much more solid and capable, at least in my experience. Oh, and I can't get over how quiet the GT is, engine wise, compared to the 2.5i. Open to suggestions on what some good, cheapish mods are for the GT without going overboard. Last edited by chris12 on Mon Jul 20, 2015 9:59 am, edited 12 times in total. I envy how clean your car looks in those pics. Good to hear you're happy with the purchase! Super tidy. Looks to be in great condition! Is 11,580km a typo? lol - I've done 14,000k's since I got my Liberty in May!! It is . Left a zero off the end. Just making sure you guys were reading... . Thanks though. It is in good nick. It's in better condition than my old 2.5 externally. Internally it's about the same. Thing with my 2.5 was that the previous owner must have changed the shocks or something because it felt a lot harsher than the GT does - more like a Spec B in that regard, if not a fraction harsher. The GT had a few rattles in the suspension, took it in yesterday to have a look. Tower strut nut was a quarter turn loose and the rear sway bar needed a bit of grease. Hopefully that does the trick. Got myself a Belkin CarAudio Connect from the Apple Store. It goes by another name too, but I can't remember what that is. Also purchased the genuine Subaru AUX port so I can use this device. Tried the Anycar Link and that didn't work, so I just went down this route. $99, allows me handsfree bluetooth audio streaming and make / receive calls. It's good value for money, but nothing spectacular. It connects with my iPhone when I want it to and plays music really quite well. The phone call quality is OK. It's not great but not too bad either. Good for in car, but I wouldn't want to have a conversation for too long. I haven't fully installed it (found a place to put it permanently) but when I do, I'll post some pictures. Got my air-conditioning re-gassed today. Huge difference and not really any leaks to speak of. So that's a positive, I think! Also had the timing belt service completed. Subaru said my rear brakes were just about gone, so I got some new Bendix General CT pads with RDA rotors (wanted DBA, but I'll get them for the front when the time comes). Stopped a sqeak (might have been the handbrake) when I got in and out of the car. So, pretty happy with that. Changing the rear rotors is a massive pain. Can't believe how difficult the two screws are to get to behind the rotor. Glad its done. chris12 wrote: Changing the rear rotors is a massive pain. Can't believe how difficult the two screws are to get to behind the rotor. Glad its done. Good read and the GT looks so clean! As above that is bad news, I changed my rotors and pads in my vx commodore and could get that done in 5min a corner! I was hoping that the lib wouldn't be that hard I'm still going to give mine a crack when they are due soon cause it's not that hard (apart from these bolts you mentioned) to change them and saves a fortune! Yep, well worth doing yourself. I don't mind working on my car, only that it takes me 2 times longer than everyone else. Haha.. plus, it feels nice to have done it yourself. Only change is the black and white number plates. Also purchased AVO HD mounts and a rear Whiteline sway bar but I haven't received it yet. Installed my AVO HD Mounts with Adjustable 22mm Whiteline Rear Sway Bar. Haven't had a good drive in it yet, but liking the improvement. I think I'll notice it more around the twisties than general driving, but its still good! Also "plasti-dipped" (except... Armor All Custom Shielded) my front grille wings. I'll see how it holds up. Was $27 from Supercheap. I'd like to get an STI lip if I can. I think it'd bring the black and blue theme together nicely. How's the texture of the Armour-All? I was looking at it yesterday - keen to do my wheels white, just worried about it being impossible to clean the brake-dust off... although I should probably photoshop it first! Might look awful lol. Loving your car. So clean. Came second last time. Hopefully this time! tony_m wrote: How's the texture of the Armour-All? I was looking at it yesterday - keen to do my wheels white, just worried about it being impossible to clean the brake-dust off... although I should probably photoshop it first! Might look awful lol. I like it. I think I could have done a better job, but it's not too bad. I'll grab a photo for you and post it up. It does have a matte finish as expected. I think you'd struggle to keep your wheels clear and it has quite a gritty feeling to it. That's what I thought, but I wondered as the box the can is in says ideal for... Car Bra, Stripes, Wheels. And it seems it's the international go-to for a quick wheel refresh! I think I should hold out till tax time and just buy new wheels lol I'll probably end up at least trying it though! A pic would be great- cheers!